A Mottled Emigrant perching on a grass blade. Another Mottled Emigrant sighted on its perch in an urban park where its host plant is found. 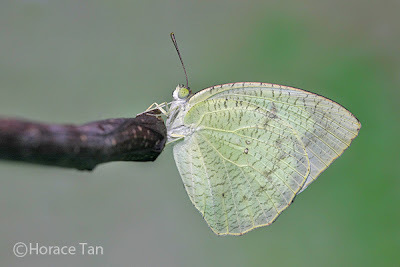 Above, the wings are greenish white and the forewing has a black apical border and a black cell-end spot. This black border and the cell-end spot are respectively broader and larger in the female than in the male. Beneath, the wings are of a darker and greenish-ochreous hue and there are many rather faint and short transverse striae in reddish brown, giving it a "mottled" appearance. A newly eclosed female Mottled Emigrant resting near its pupal case. Another newly eclosed Mottled Emigrant. 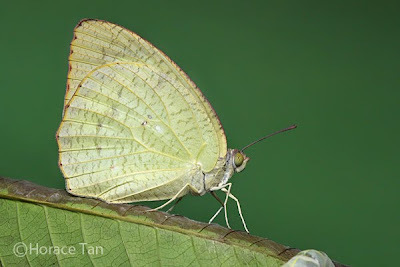 Field Observations of Butterfly Behaviour: The Mottled Emigrant is described in C&P4 as being the commonest and most widespread species of Catopsilia in Malaya. 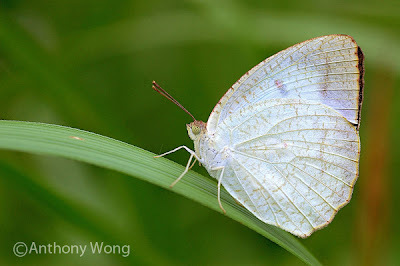 However, the reverse is true in Singapore as it is the rarest of the three Catopsilia species locally. The fast flying adults are typically found at the fringes of nature reserves or in a few wastelands where its host plant, Senna alata, is growing. In addition, where this plant is cultivated, it is likely that Mottled Emigrant will make its appearance as well. 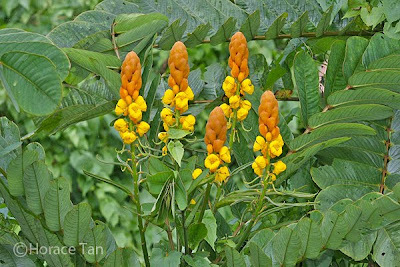 The host plant, Senna alata, is a shrub up to 3m high with flowers growing in columns resembling fat candlesticks. The leaves are simple pinnate with large leaflets, each of which is 50-80mm long. The caterpillars of the Mottled Emigrant feed on the relatively young to middle-aged leaflets. Host plant: Senna alata (Seven Golden Candlesticks). 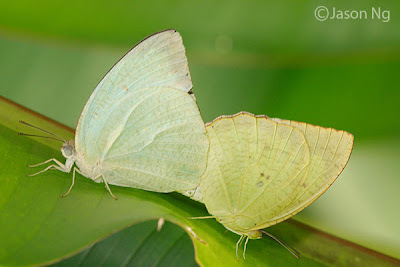 A mating pair of the Mottled Emigrant. 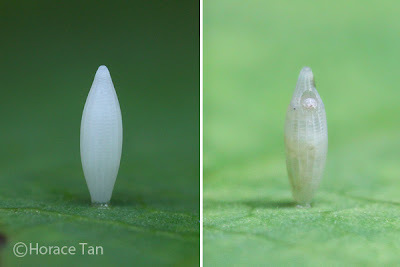 The eggs of the Mottled Emigrant are laid singly on the upperside of a leaflet of the host plant. At times, more than one egg can be found on the same leaflet. The long spindle shaped egg is laid standing at one end with a length of about 1.7-1.8mm. It is white in color with vertical ridges and numerous indistinct and intermittent horizontal ridge lines. The micropylar sits at the tip of the standing egg. Left: fresh egg. Right: mature egg showing the head at the hole near the top. The egg takes about 2 days to hatch. 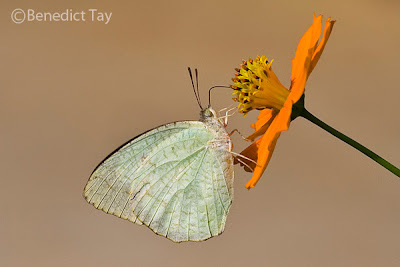 The newly hatched has a length of about 2.7mm and has a pale white to yellow head capsule. It has a cylindrical and pale yellowish green body featuring dorsal, dorso-lateral and lateral rows of small tubercles running lengthwise. Each tubercle has a short seta emerging from the middle of it. 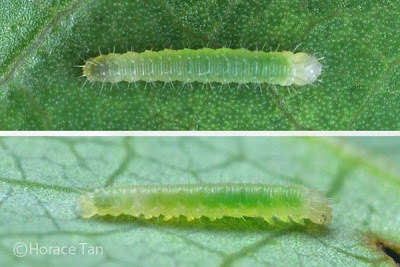 Two views of a 1st instar caterpillar, early in this stgae, length: 2.8mm. 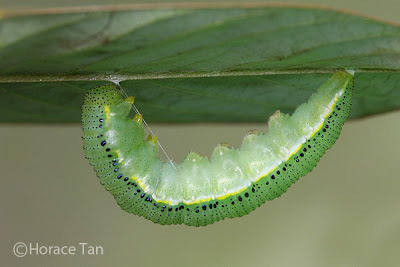 After hatching, the young caterpillar eats the empty egg shell for its first meal, and then moves on to eat the leaf lamina. The growth is fast paced and the body length reaches about 4.5mm in this 1st instar which lasts just 1.0-1.5 days. 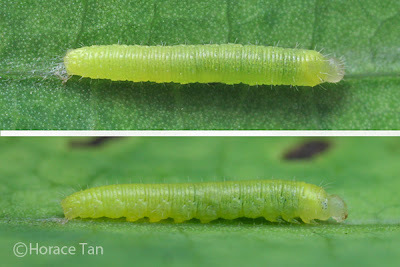 Two views of a late 1st Instar caterpillar hours before its moult, length: 4mm. 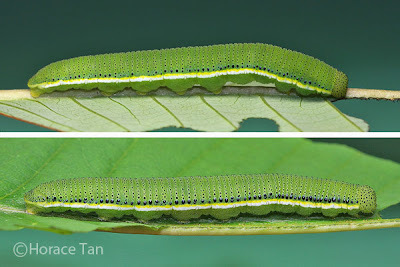 The 2nd instar caterpillar is yellowish green in color on both body segments and the head. The body is covered in rings (about six for each body segment) of numerous small black tubercles from which very short setae emerge. The head capsule also features numerous similar tubercles. This instar lasts about 1-1.5 days with the body length reaching 8-9mm. 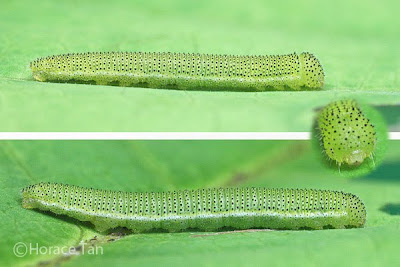 The 3rd instar caterpillar resembles the 2nd instar caterpillar closely except for the appearance of a faint whitish lateral lines. Towards the end of this instar, a faint yellow line also appears on the upper edge of this white line. This instar takes about 2-2.5 days to complete with body length reaching about 12-14mm. 3rd instar caterpillars. Top: 9mm. Bottom: 12mm. 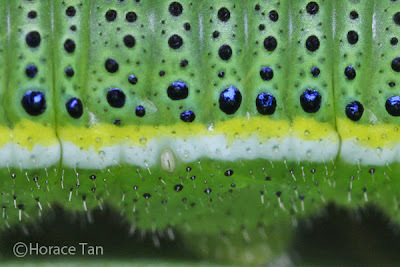 The white-yellow stacked lateral line on the 4th instar caterpillar is much more prominent. Furthermore, the first or first 2 rows of dark tubercles above this lateral line are larger with a bluish shine, thus forming prominent outline to the white-yellow line. This penultimate instar lasts 2-2.5 days with body length reaching about 23-25mm. 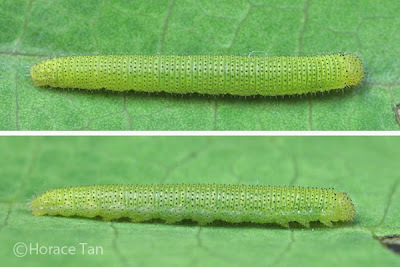 Two views of a 4th instar caterpillar, early in this stage, length: 14mm. A close-up view of the stacked white-yellow line and row/rows of larger black tubercles above. 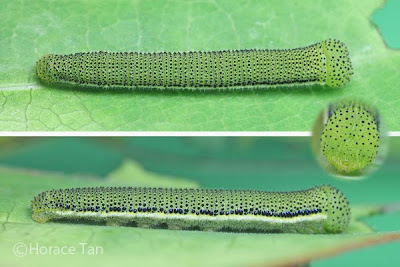 The 5th and final instar caterpillar resembles the 4th instar caterpillar closely with no obvious changes. 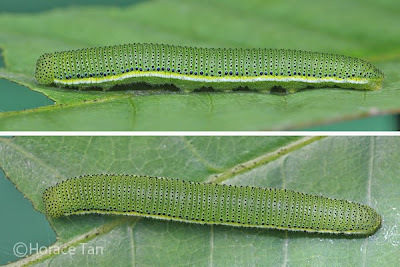 The 5th instar lasts for 2.5-3 days, and the body length reaches up to 41-45mm. 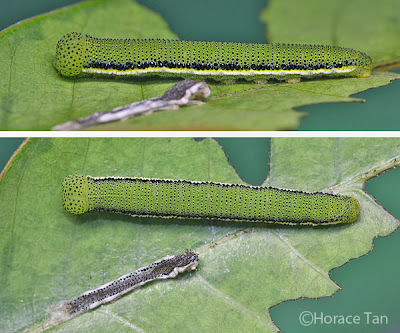 Two views of a 5th instar caterpillar, newly moulted, length: 26mm. 5th instar caterpillars. Top: 39mm. Bottom: 45mm. 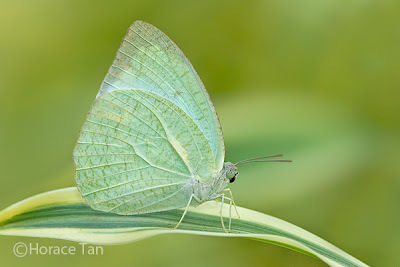 On the last day of the 5th instar, the body of the caterpillar shortens and changes to a dull shade of pale green. It ceases feeding and comes to rest on the midrib on the underside of a leaflet or the stem/stalk on the host plant. Here the caterpillar spins a silk pad and a silk girdle to secure itself and then becomes immobile in its pre-pupatory pose. A pre-pupatory larva of the Mottled Emigrant on the leaf underside. Pupation takes place about 0.5 day later. 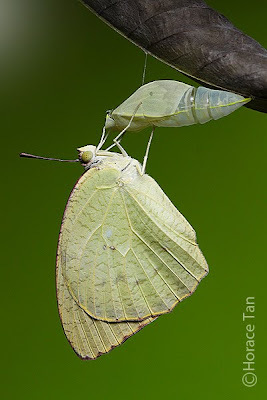 The pupa secures itself with the same silk girdle as in the pre-pupal stage, but with cremaster replacing claspers in attaching the posterior end to the silk pad on the stem. 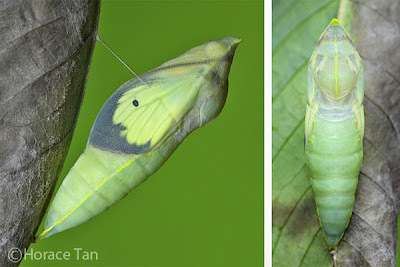 The pupa has a pointed head, and its yellowish green body has a yellow lateral line on each side. There is a dorsal protrusion with a yellow ridge line on the thorax. The keel formed by the tapering wing case is much less pronounced than those seen in the Eurema spp. The pupation event of a Mottled Emigrant caterpillar. 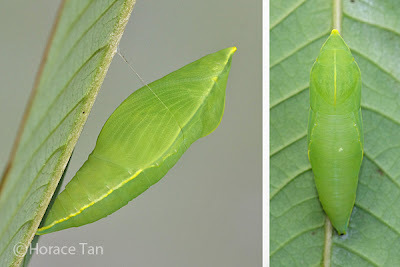 Two views of the pupa of a Mottled Emigrant. Two views of the mature pupa of a female Mottled Emigrant. The now transparent wing pad shows the broad black border and cell spot. After about 5 days of development, the pupal skin turns translucent as the development within the pupal case comes to an end. The yellow coloration and black borders on the forewing upperside are now discernible. The following day, the adult butterfly emerges from the pupal case. 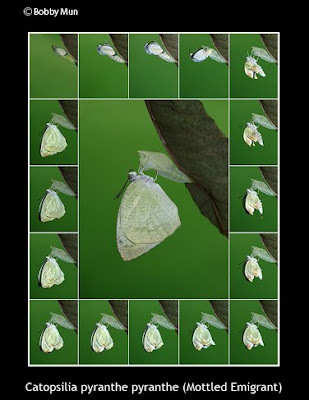 The eclosion sequence of a male Mottled Emigrant. A newly eclosed Mottled Emigrant drying its wings on its pupal case.